The meaning of this pole is not clear. 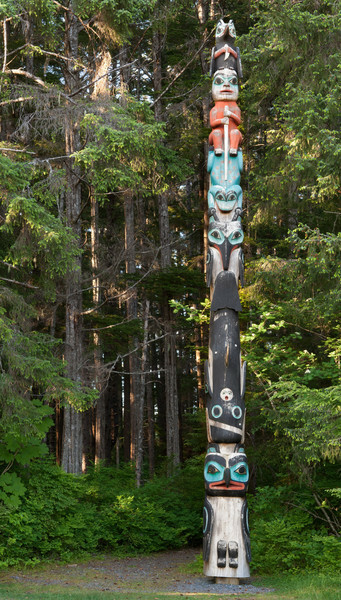 According to the guidebook of the Sitka National Historical Park (Carved History") it is not clear whether it is a story pole or a crest pole and goes on to comment that the "top figure is probably Raven holding a crescent moon, although changes in the wings and disappearance of the wings (in copies of the pole) have led some to identify the carving as an owl." Some say that the whale near the bottom of the pole was meant to illustrate the legendy of the raven and the whale, a legend in which a raven became trapped inside a whale, began eating the whale, and the whale became beached.